Farrar, Straus and Giroux (BYR), 9780374304560, 224pp. The Newbery Award–winning author of Dead End in Norvelt shares advice for how to be the best brilliant writer in this funny and practical creative writing guide perfect for all kids who dream of seeing their name on the spine of a book. With the signature wit and humor that have garnered him legions of fans, Jack Gantos instructs young writers on using their "writing radar" to unearth story ideas from their everyday lives. Incorporating his own misadventures as a developing writer, Gantos inspires readers to build confidence and establish good writing habits as they create, revise, and perfect their stories. Pop-out text boxes highlight key tips, alongside Gantos's own illustrations, sample stories, and snippets from his childhood journals. 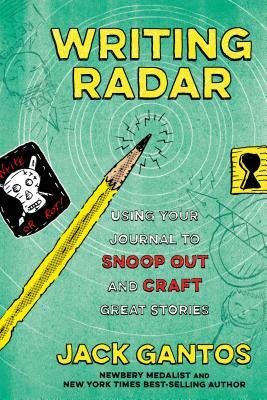 More than just a how-to guide, Writing Radar is a celebration of the power of storytelling and an ode to the characters who—many unwittingly—inspired Gantos's own writing career.